Caught In The Storm | MAKE YOUR OWN BREAK! 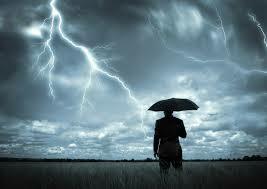 It is crucial to stay focused and centered in the middle of a storm of work raining down on you. It’s exciting to get multiple calls and offers in a short period of time but don’t underestimate the emotional toll it can take and the stress that comes with it. Things can move quite quickly when you are in the flow and it’s easy to get thrown off track. It is very common to be juggling multiple project and wearing many hats in this industry. Many of us bounce around from being talent to background and from crew to creators. When I feel overwhelmed by multiple projects coming in at once I have no choice but to get super organized to insure each project gets enough attention so none of them fall short. First I tackle one project at a time and make a list of all the steps I need to take to execute the job from start to completion – be it prepping for an audition, breathing life into a new role, revising a script, launching a book, producing a play or shooting a film. Some projects are short term, a few days, and some span over years. Once each project has a list of steps, I transfer the different steps onto a timeline making sure all the steps for each project can be executed in order to make the deadline/insure the project’s completion. Each time a new project comes in, I immediately write out the execution steps and transfer it onto a timeline, I refer to this timeline daily as a guide of what I need to work on each day and constantly update it. This timeline also makes it clear to see where I have openings to take new work on and where there is too much overlap – if a project doesn’t fit into the timeline, I don’t have the time to take it on; this way I can always stay a few steps ahead. This entry was posted in Low Budget Production, Performance Art, Producing Advice. Bookmark the permalink.